We’re in Spring and Summer is almost upon so that means the Alaska cruise season is now starting to increase. 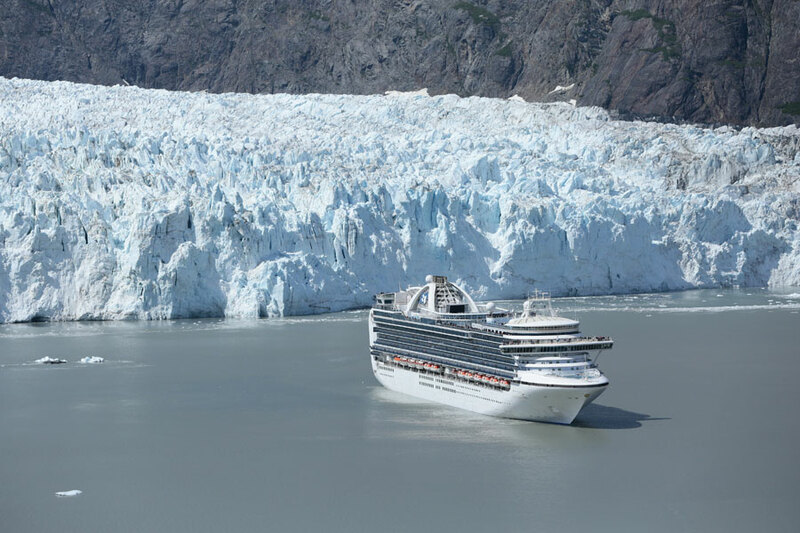 Princess Cruises which is the leading cruise line in Alaska has now kicked off the season. Princess Cruises will have a total of seven ships sailing the region for the Summer and leading the way will be the recently refurbished Golden Princess. The ship has new features and enhancements to proved the best experience while sailing Alaska. The cruise line os offering guests unique and stunning itineraries, cruise tour options, on-land adventures and a lot more which will enrich Alaska during a Princess Cruise. Let’s take a look at what Princess is offering for the ultimate Alaska cruise with good port options and cruise tours. The most popular Gulf of Alaska sailings between Vancouver, B.C. and Anchorage (Whittier) offered by Princess Cruises features two glacier-viewing experiences on every voyage, with visits to the UNESCO-listed Glacier Bay National Park plus either Hubbard Glacier or College Fjord. These cruises are offered aboard Island Princess, Coral Princess, Star Princess and Golden Princess. This awe-inspiring part of Alaska, known for its lush scenery and pristine fjords, will be featured on seven-, 10- and 12-day roundtrip voyages from Seattle, San Francisco and for the first time ever, Los Angeles. Ruby and Emerald Princess sail on seven-day cruises roundtrip from Seattle with all Ruby Princess cruises featuring a visit to Glacier Bay National Park. Grand Princess sails out of San Francisco, featuring five departures visiting Glacier Bay. Two 12-day cruises roundtrip from Los Angeles aboard Emerald Princess and Golden Princess will also include Glacier Bay. In addition, cruisetours offer a more immersive experience and the opportunity to visit Denali National Park. Land tours are combined with a seven-day Voyage of the Glaciers cruise and include the company’s premier wilderness lodges, exclusive Direct-to-the-Wilderness rail service, plus visits to the top two attractions in Alaska – Glacier Bay National Park and Denali National Park. The line’s most popular cruisetour option, these itineraries feature multiple nights at the Denali Princess Wilderness Lodge and/or Mt. McKinley Princess Wilderness Lodge. Most offer Princess exclusive Direct-to-the-Wilderness rail service between the ship in Whittierand the Denali area all in one day, plus the opportunity to explore Fairbanks and/or Anchorage. An affordable option for independent-minded travelers, these itineraries offer a flexible way to see the heart of Alaska. Tours follow similar routes as Denali Explorer options, but do not include any pre-planned excursions, giving travelers the opportunity to customize their own experience. These itineraries are designed to take travelers beyond Denali to sought-after, remote regions of the state such as the Kenai Peninsula and Wrangell-St. Elias National Park and Preserve. The line’s highest level of service, these cruisetours provide a truly immersive experience. With a professional tour director, most meals included on land and enhanced sightseeing, guests experience the best of the Great Land. Here at Cruise Hive, we hope you have a chance to cruise in Alaska with Princess Cruises. Take a look at the best cruise prices for Alaska and deals.